A sign stands outside of an entrance to the U.S. Naval Academy campus in Annapolis, Md., Thursday, Jan. 9, 2014. The U.S. 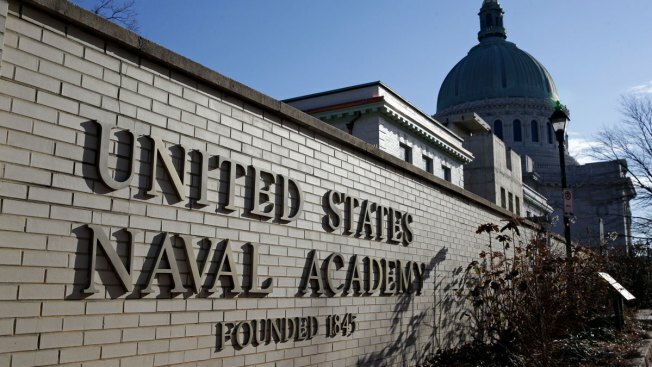 Naval Academy is inviting the public to see art and poetry by students at the school. The exhibit of work by students, called midshipmen, is on display at the school's Nimitz Library until May 26. The school said in a statement that the display showcases nearly 100 works of art by 40 midshipmen and includes digital photography, oil paintings, pencil, charcoal, ink, watercolors, acrylic and one piece of sculpture. Nine works of poetry are also on exhibit. The exhibit is on the first floor of the library and is open to visitors Monday through Friday from 7:30 a.m. to 6 p.m. and Saturday and Sunday from 10 a.m. to 6 p.m. Visitors are asked to sign in at the checkout desk on the first floor.